How is Great Salt Lake involved in stop­ping bullets, refining oil, making jet air­craft, and fabricating artificial hips? 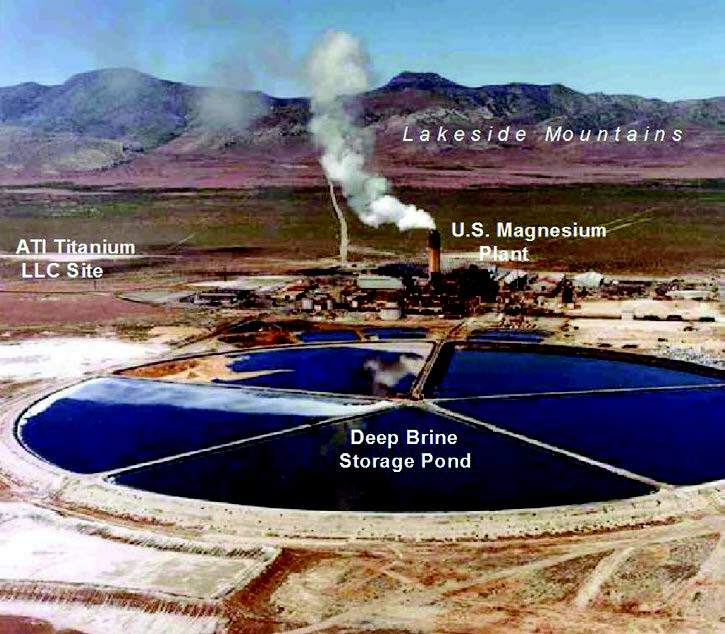 The answer is that magnesium recovered from lake brine is used to refine tita­nium, and the west shore of Great Salt Lake is the site of a new titanium plant. Titanium is used in the manufacture of military armor, oil refinery equipment, jet engines and airframes, and medical prostheses like artificial hips. 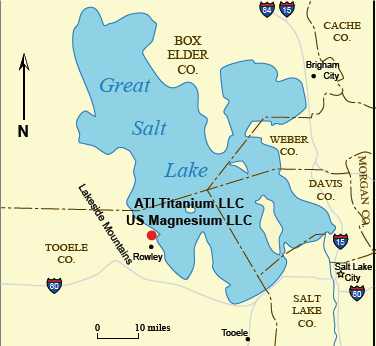 ATI Titanium LLC (a subsidiary of Allegh­eny Technologies Incorporated) is fin­ishing construction of one of the larg­est titanium sponge plants in the United States, at Rowley, Utah, adjacent to the U.S. Magnesium plant. Titanium sponge is titanium metal that is porous and sponge-like because of the manufacturing process. High-purity titanium tetrachloride (in liquid form) is chemically reduced to yield metallic sponge, which is then further refined. Magnesium metal is used as the reductant in the Kroll process, which is the chemi­cal process that will be used at the Allegh­eny plant. The Allegheny titanium plant is the first new titanium sponge plant built in the U.S. in more than 30 years that is not just an expansion of an existing facility. In the United States, titanium sponge is pro­duced only in Nevada, Oregon, and Utah. Locating the Allegheny plant adjacent to the U.S. Magnesium plant undoubtedly saved time and effort in the regulatory approval process, but the main advantage is the saving of money and energy because of the compatibility of the two plants. Allegheny reacts magnesium metal with titanium tetrachloride in a furnace and produces magnesium chloride as a by-product. U.S. Magnesium separates mag­nesium chloride in a furnace into magne­sium metal and chlorine. Because of the proximity of the two plants, molten mag­nesium and molten magnesium chloride can be cycled between plants without cool­ing and without trucking or rail transport, saving energy. Allegheny started building the $460 mil­lion plant in the first half of 2007. It will begin production in late 2008 and achieve its full annual capacity of 24 million pounds of sponge by the second half of 2009. The plant is designed to accommodate future capacity expansion of up to an addi­tional 18 million pounds of sponge. Strong international demand for tita­nium products and rapid price increases made construction of the Allegheny plant attractive. Allegheny’s 2007 Annual Report projected international demand for titanium mill products to increase from 120 million pounds in 2006 to 350 million pounds in 2011. Allegheny’s pro­duction of titanium mill products was 32 million pounds in 2005, but is esti­mated to be 50 million pounds in 2008 and more than 60 million pounds by 2011. To meet this additional demand, Allegheny is also expanding production capacity at its Albany, Oregon, sponge plant, and has been buying sponge from Kazakhstan and Japan and recycling titanium scrap. The price for titanium mill products increased from $11.50 per pound in 2003 to about $30.14 per pound in 2007. Increased demand for titanium results from its superior char­acteristics that make it desirable in many growing industries. Titanium is strong and light, heat and corrosion resistant, and has low thermal expansion compared to competing materials; these characteristics often make it the material of choice despite its generally higher cost. Aerospace applications account for 76 percent of the titanium used worldwide. 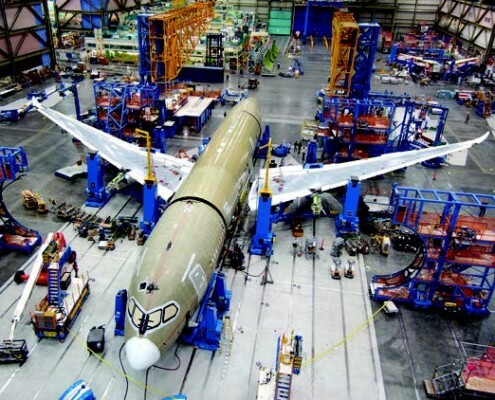 A good example of the trend toward increased use of titanium is in the construction of aircraft. The Boeing 787 “Dreamliner,” for example, is designed to achieve improved fuel economy by using a titanium frame covered by a composite skin. One Dreamliner requires 250,000 pounds of titanium, exclusive of the engines, which also contain large amounts of titanium. The energy efficiency of the Dream­liner helped The Boeing Company to sell 900 of the planes to 58 customers from 2004 to May 2008—the most successful intro­duction of a commercial airplane in aviation history. Allegheny has a long-term supply agreement with The Boeing Company for titanium mill products that extends from 2007 to 2015. Another indication of the growing demand for titanium is that the Alta Group (a subsidiary of Honeywell International, Inc.) has increased capacity at its Salt Lake City titanium sponge plant to 1.13 million pounds. This plant, opened in 1996 by Johnson Mat­they, Plc. (Public Limited Company), produces titanium sponge by the Hunter process, using sodium as a reductant. About 10 percent of the sponge is sold and the other 90 percent is for Hon­eywell’s internal use. It is refined in Fombell, Pennsylvania, into ultrapure titanium for semiconductors. Construction of Allegheny’s new plant reinforces the economic importance of Great Salt Lake to the state of Utah. As much as 24 million pounds of titanium will join the existing list of mineral products from the lake: salt, potash, magnesium metal, chlorine, and other potassium and magnesium salts. The Allegheny plant will also add about 150 high-paying jobs to Utah’s economy.